In addition to each dinner show’s website, we have posted our own review of each listing where you have the opportunity to comment on each dinner show restaurant attraction. It’s the era of mobsters, dames, Al Capone, Buggs Moran, prohibition, and speakeasies. This fun-filled show takes you on a trip back in time to a raucous and wild time in American history. But don’t be concerned this show is family friendly and fun for all ages. Wrestling with class and character located in Winter Haven, Florida. This dinner show provides professional wrestling entertainment, a 3-course dinner, and a meet & greet after the show. 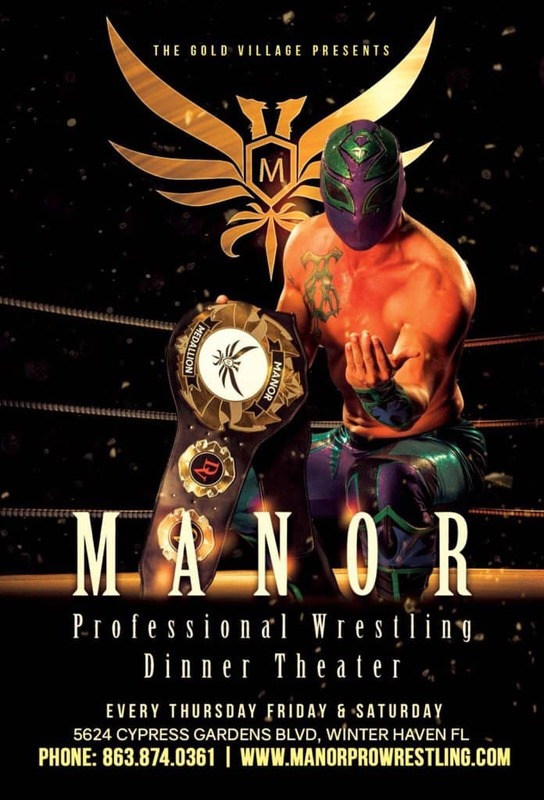 Manor Professional Wrestling Dinner Theater brings a traditional dinner show adventure up to the next level. 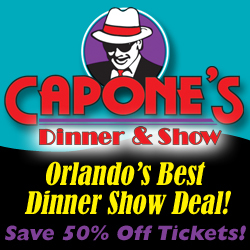 Orlando’s only magic dinner show! High energy standup comedy combined with astounding feats of magic and audience participation sure to tickle your funny bone. A ninety minute experience this dinner show combines magic, comedy and audience interaction. Set sail on a pirate ship for swashbuckling fun on the high seas! The Princess Anna has been taken hostage and this group of dangerous pirates is on a mission to rob, pillage and plunder. Musical productions and astounding acrobatic feats makes for a night of fun!Port of call feast is included; meal upgrades and VIP experience are available at an extra cost. A basic who done it murder mystery dinner show featuring multiple shows and three theatres providing an audience interactive show which includes much off the cuff humor. Clues are delivered and guests compete to identify the killer and win prizes. Treasure Tavern Dinner Show – This Orlando dinner show has been suspended for an indefinite time! The Treasure Tavern Dinner Show was voted by Orlando Sentinel readers as the Best Live Show back in 2011. Adults will enjoy this European-style dinner show as it takes them back to the period of pirates, scurvy, and treasure. Children are not allowed into the show because of the elements of burlesque, cirque, and adult comedy used by the performers. While listening to fascinating stories of hidden treasures, you will be able to enjoy a tasty dinner of mashed potatoes, beef tenderloin, asparagus and rum. The Treasure Tavern dinner show will surely keep you smiling and laughing all night long. If you are visiting Orlando with your kids, then you must take them to the Hoop Dee Doo dinner show. The show is a comedy, Western, and Country style musical that is full of singing, thigh slapping, singing, and fun. Your whole family can enjoy the all-you-can-eat mashed potatoes, smoked barbecue pork ribs, southern style fried chicken, fresh vegetables, and corn on the cob. The Hoop Dee Doo dinner show takes place at the Pioneer Theater in Fort Wilderness Resort inside the Disney property. Sea World Makahiki Luau – This Orlando dinner show has been discontinued! Arabian Nights Dinner Attraction: This Orlando dinner show has been discontinued! The storyline at this long-established show is one of Arabian Princes and Princesses along with their Royal entourage. The show is done in an arena setting because of the many exquisite horses that join in this lavish production.